After attending the MOOCS – Which Way Now? ALT MOOC SIG Conference on 27 June 2014 my mind was extra full of thoughts and new ideas. There is a record of the day through my own Storify summary and original programme as well as blog posts such as Claire Sewell’s. What are the drivers for institutions providing moocs? To develop a network of practice, ideas and knowledge collaboratively (ICT in Schools): learningdesigner.org (Diana Laurillard). This made me think could this be conceptualised as an educational #meme being shared? Universities emerged because people in cities wanted access to new technologies (eg books) says @fredgarnett. Are MOOCS disrupting this and offering an alternataive? Interest driven learning works says @fredgarnett#altmoocsig they’ll follow their own interests and widen out. A guide ontheside not a sage. How to measure – cynical approach from Hellean Gillespea – can use all metrics to say they are successful – (Helena Gillespie) – also read: MOOC expectations and reality report. less ‘swish’ video comes across as less corporate? Dilemma.. Would people think it’s amateurish if the ‘swishness’ was less? (James Little). Drop out rate and moocs – trying to intervene: Sherif Halawa (Stanford). My thoughts are that this might be trying to fix something which is actually inherently wrong with the way some moocs are implemented – not enough community and too self-directed? 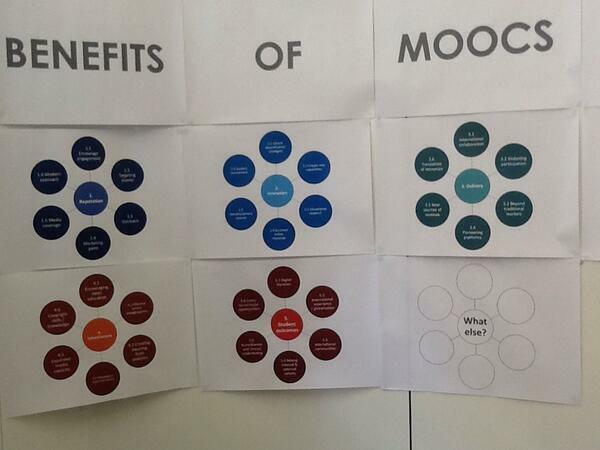 Too much focus on moocs and money – it’s not about that (Matt Jenner) – see benefits above under successes of moocs. So, after attending a conference and seeing all the themes and different and complementary views come out it’s time to make sense of them in a purposeful way – i.e. feed them into my current dissertation work on MOOCS. Originally, last year I had wanted to focus on the pedagogy of MOOCS – but I think that analysis and comment around this (and critical voices around lack of applying existing distance learning pedagogy to MOOC activity) has already started to be covered in the literature. What I see now is a need to understand how and why have been implemented at different institutions and for whom. Further thoughts to come… (some of this is being worked on behind closed doors for the moment)… but I hope to share more soon. 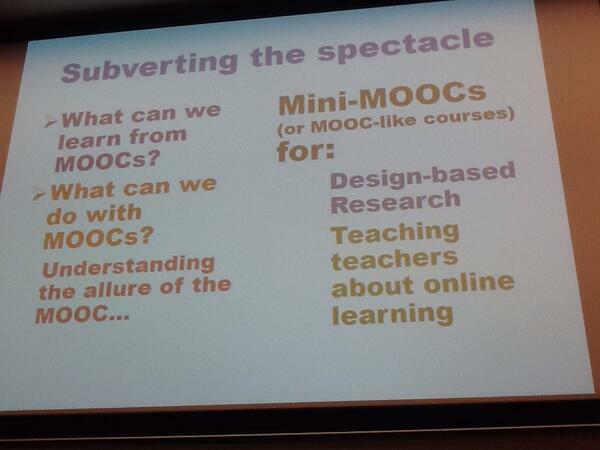 One Response to "Thoughts and Reflections after attending: MOOCS – Which Way Now? ALT MOOC SIG Conference – 27 June 2014"
Education, Learning and Technology by James Little is licensed under a Creative Commons Attribution-NonCommercial-ShareAlike 3.0 Unported License.